No doubt about it, summer is gone-zo! It left in pretty quick fashion late Monday. I last wrote on Monday and as I was writing, the temps were falling and Tuesday’s high was only 53 degrees. We then spent most of the rest of the week in the 50’s for highs, although did sneak up to 63, but today’s high has only been 43! We still have not had to turn the heat on, but the fireplace has been turned on a few times. I believe I will turn the heat on once I am done putting this entry out, as I do not want to wake up to a super chilly house and I also do not have any desire to see how long we can go without turning the heat on. While out and about the past few days, I did smell the smell of wood burning, so many folks have turned their heat on and those using wood are casting that wonderful smell. I guess that is about the ONLY thing I miss about not heating with wood anymore. The smell was always nice, especially at this time of the year. Just really set the mood for autumn. However, I am not even remotely close to missing the smell of wood burning to go back to heating with it! Nor will I ever, I suspect! The trees are all in a state of changing color. Very few are at or even near peak, but the greens of the summer are all fading away and giving way to the yellow’s, orange’s and red’s of autumn. I suspect that in about 2 weeks we will be close to peak, which will be about average for us. Hard to tell if it will be an unusually magnificent color show or just our regular form of magnificent, but it is really neat to see the change underway. Yesterday morning I took Huck and Millie on a quick walk. Temps were in the 40’s, with sunny skies and that crispness in the air that only autumn seems to bring. As I looked around at the trees in the midst of change and the beautiful blue skies, I couldn’t help but to smile a big old smile. “This is what I spend all summer waiting for!”, was my thought. No snow yet, but it has gotten close. Just the other side of the big pond, the snow has been falling already. Some of the inland areas of the north shore of Superior have already seen their first wet coating of snow. It looks like some areas of the upper Midwest could see their first snowflakes of the season later this week. It is always a touch and go situation for us, as the lake modifies the air enough that we can see rain, while areas just a bit to our south see snow. I’m fully ready to feel that tingle and spark of joy at seeing the first flakes of the season, but also am content to not see much in the way of accumulation. I still have some outdoor chores to take care of and need around 3 days of decent weather to get them done. It looks like tomorrow will be a good day for sure and I suspect that there will be at least 2 more before the cold and wet or snowy weather sets in for good. It seems hard to believe that we are at the final week of September already. I think September goes by faster than all the other months. December is a close second, but the excitement for Christmas seems to keep it from racing by as quickly as September does. I think what really made this September go by so fast is that we had August type weather happen right through the 16th of September. So in reality, we have only had about a week of September type weather, but the month is just about over. Not a whole lot has been going on up here, except for Nora and I chasing Bleau around with a role of paper towels and cleaning up his messes! He is making progress, but still has quite a few accidents in the house. I will say that he is the most unusual dog to get house broken I have ever experienced. At one time, he seems to have the hang of it, by giving us a little warning and then waiting for us to get there to let him out, while at other times, he just will let it rip. Even when he was just out less than 5 minutes ago and went, sometime more than once while outside! He does make it through the night and seems to be able to hold it longer if he is in his crate. Life sure will become more laid back when he is finally house broken, that’s for sure! The one thing that became very apparent to me when he joined our family is how wise Huck and Millie are. I know they are pretty well behaved and are very low maintenance, but all the little one work commands that they know I just took for granted. It may sound strange, but they even seem to realize their wisdom and many times seem to want to impart it upon the new guy. For his credit, he pays very close attention to them and almost seems to idolize them. He follows them around where ever they go and the other day they were both playing with a stick and he just sat down and took notes. He is growing too. Just a week ago, I watched Huck stand over his food bowl, but not eat from it, as he knew it was not his. Bleau came from underneath, walked between Huck’s two front legs and proceeded to eat while standing between Huck’s legs. He would not fit underneath Huck without crouching down now. 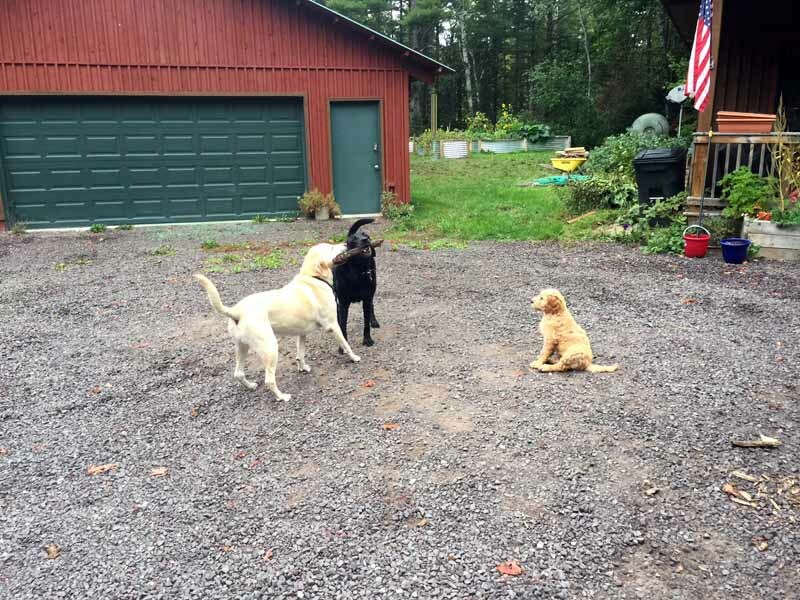 I think it will be more fun for all of them once he is closer to the size of Huck and Millie. Right now, they see him as more of an ankle biter…which…he is! 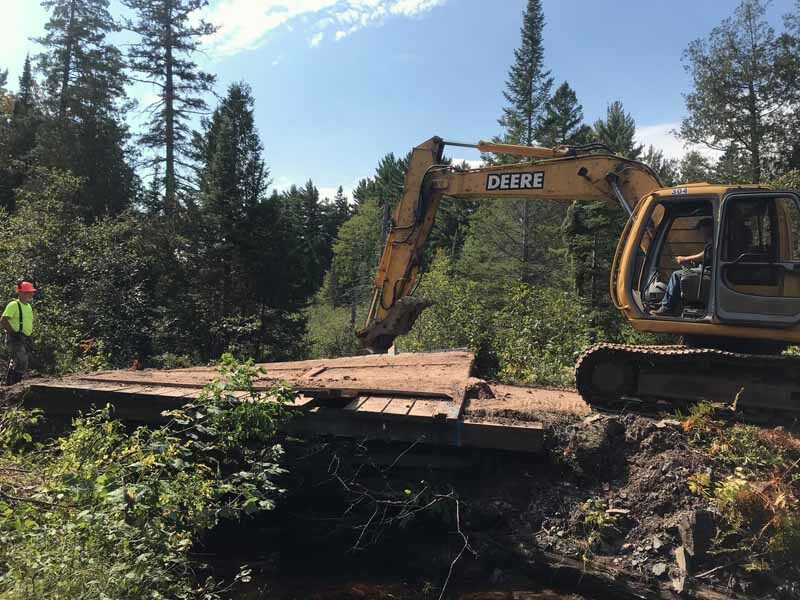 As I have mentioned in previous journal entries, the Keweenaw Snowmobile Club will be holding its annual trail work session to get the trails in shape for when the snow flies and the snowmobiles start running on them. We have been busy with some projects already. 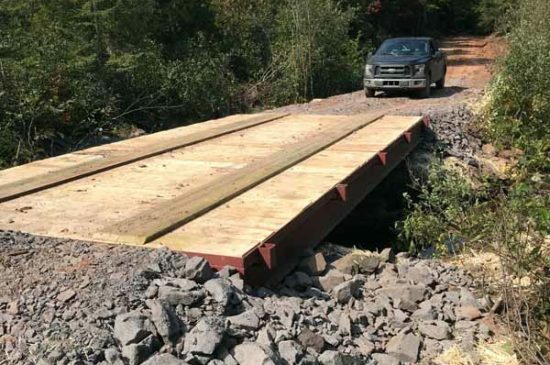 A bridge on trail 124 was replaced this week. It was a pretty old one and in dis-repair. 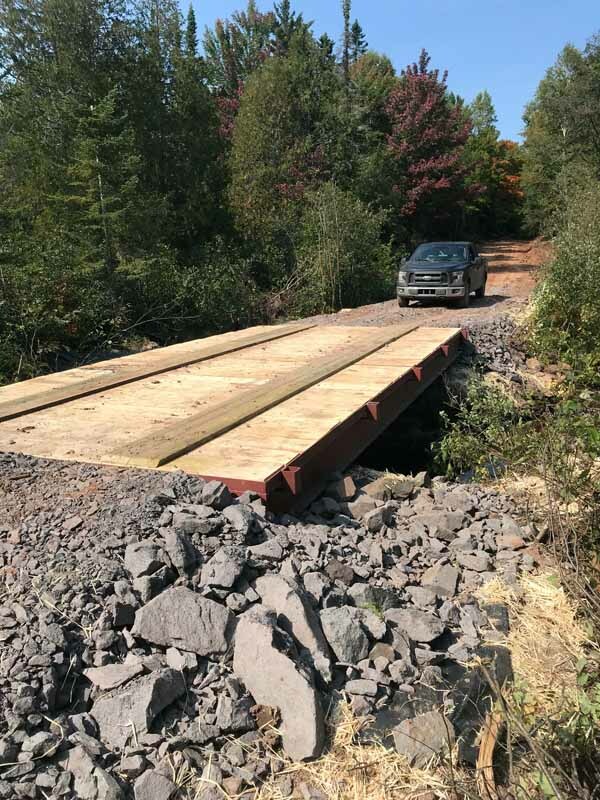 The new one uses a steel frame with wooden decking and should last a lot longer. There are still the railings to build and that might even be one of the jobs for the work session October 19-20. I will be getting together with our trail boss this week and next to travel most of the trails and compile a list of jobs that need to be done. Sounds like a pretty good crowd is already planning to attend and I know we can use all the help we can get! So I guess that about covers it for this one, perhaps the next writing will have some pics of flakes in the air!